Cocktail Reception Sponsorship gives you a table of 10 people at the annual dinner, logo on dinner video, recognition from the podium, event signage as well as the ability to bring pop-up sign, placards, and display materials. 1 table of 10 people at the annual dinner, full-page recognition on dinner video and at podium, event signage as well as the ability to bring pop-up signage, placards, and display materials. Gold sponsorship gives you a table for 10, ½ screen recognition on dinner video, and event signage as well as the ability to bring pop up sign, placards, and display materials. Winner?s Reception - $2,000Winner?s Reception Sponsorship gives you recognition on dinner video, logo on cocktail and dessert napkins, as well as the ability to bring pop-up signage, placards, and display materials. Silver sponsorship gives you a table for 10, recognition on dinner video, and event signage as well as the ability to bring pop up sign, placards, and display materials. Please contact the Chamber at 304-292-3311 or email terri@morgantownchamber.org for more details. We are pleased to offer advertising opportunities with our Annual Dinner publication. The annual publication celebrates the membership and accomplishments of our shared business community, and is distributed to the Dominion Post?s entire circulation and at the dinner. View pricing here or contact the Dominion Post at chamberreport@dominionpost.com. 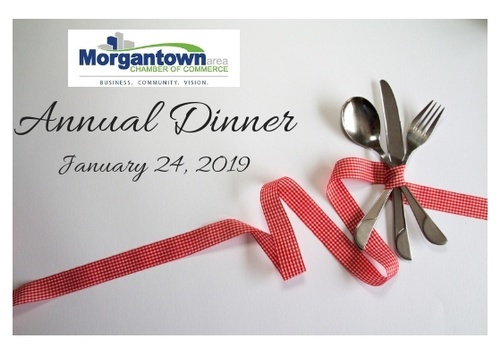 The Morgantown Area Chamber of Commerce Annual Dinner will be held on Thursday, January 24, 2019. Join us for our signature event celebrating the membership and accomplishments of our shared business community.